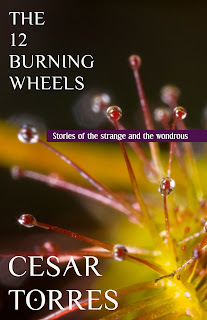 To order The 12 Burning Wheels, go to Amazon to order it in print, or click here to order electronic versions directly from M-Brane (scroll down to section "3" of that post). These links supersede the ones posted below in the original version of this post. I'm reposting here all the order specials for The 12 Burning Wheels, which releases officially on 12/22. I have updated it with e-book options. While we are making this available on Amazon for the Kindle, I'd really rather prefer that e-book buyers get it directly from M-Brane. Why? So that Cesar can actually earn some royalties and so that M-Brane can get some kind of cut from the sale. Our royalties from Amazon on Kindle books is very small and it may never happen that we get paid, because they hold back a rather large amount before paying us. But it will be there in a couple days if one does wish to go that route. I'll update later with the Amazon links for the print version when those go live, too (we do not have the same issue with the print edition and Amazon as we do with the Kindle edition, by the way. They are handled in a totally different way by Amazon as far as paying royalties for some unknown reason). 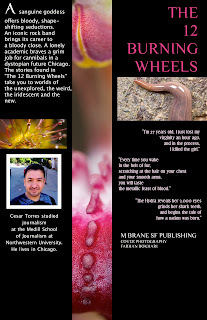 1) The print edition of The 12 Burning Wheels will sell for on Amazon for $7.99 plus shipping, but order it now from M-Brane SF for only $7.99, shipping included. Purchase includes a free subscription to the PDF edition of M-Brane SF. 2) Buy the print editions of The 12 Burning Wheels and the queer anthology Things We Are Not (TWAN) for only $18.99, shipping included. This is a serious deal, since TWAN by itself sells for almost that. This option, too, includes a free subscription to the M-Brane PDF. 3) Buy The 12 Burning Wheels and the print edition of Ergosphere (aka M-Brane #12, edited by Rick Novy) for only $15.99. The M-Brane subscription is included with this option as well. These offers will likely expire before the publication date for The 12 Burning Wheels, so act soon. Here is the Pay Pal link for them (a drop-down menu accommodates the three options). One does not need a Pay Pal account to use Pay Pal: one may use credit and debit cards, and checks by way of their e-check system. 4) This book is also available in these electronic formats: .prc/MOBI (readable on the Kindle), PDF (readable and printable on a computer and many other devices), and EPUB (readable on most devices, including the Nook). Purchase of these formats also includes a complimentary subscription to the PDF edition of M-Brane SF. Here is the Pay Pal link for them (a drop-down menu accommodates the three options). Only $3.99!